One of the members of the “New Generation” bacteria being studied by scientists is a species of bacteria called Mycoplasmas. Although most mycoplasmas are not considered important human pathogens, some species, such as M. fermentans, M. penetrans, M. pneumoniae, M. genitalium, M. pirum, M. arthritidis, and M. hominis, among others, have been closely associated with various human diseases. Mycoplasmas are most unusual self-replicating bacteria, possessing very small genomes, lacking a cell wall, passing through “bacterial-retaining” filters, displaying genetic economy that requires a strict dependence on the host for nutrients and refuge and which cause various diseases in humans, animals, and plants. Recently, mycoplasmas have been linked as a cofactor to AIDS pathogenesis and to malignant transformation, chromosomal aberrations, the Gulf War Syndrome, and other unexplained and complex illnesses, including chronic fatigue syndrome, Crohn’s disease, and various arthritides. Is Fibromyalgia caused by a Mycoplasmal Infection? Extensive clinical research is being performed around the world to further investigate how mycoplasmas contribute to the cause or progression of diseases in people, plants and animals. Here we try to answer the following questions. Written Testiment by Dr. Garth Nicolson. 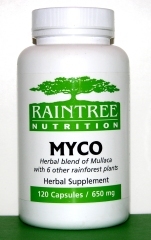 Myco + is a combination of rainforest plants long used by the indigenous people for a wide variety microbial infections. Western scientists have documented the antimicrobial properties of many of the ingredients in Myco +. This dynamic formula contains the following plants. Click on their names to see the plant database file for more information.